What is shingles? What does shingles look like? What are risk factors for shingles? What is the contagious period for shingles? What are shingles symptoms and signs? What are the stages of shingles? How do health care professionals diagnose shingles? What types of health care professionals treat shingles? What are medical treatments for shingles? Are there any home remedies for shingles? What is the duration of a shingles outbreak? What can be done for recurrent shingles? What is the prognosis of shingles? Is it possible to prevent shingles with a vaccine? fluid-filled blistering red rash, typically on the torso or face. Shingles is most often diagnosed by your doctor solely based on the appearance of the characteristic rash. Shingles can be treated with antiviral medication and pain medication. The prognosis for shingles is generally favorable, though some individuals can experience complications. The most common complication is postherpetic neuralgia, which is persistent nerve pain after the rash disappears. There is a vaccine available to help prevent shingles for certain individuals. Shingles is a disease characterized by a painful, blistering skin rash that affects one side of the body, typically the face or torso. This condition may also be referred to as herpes zoster, zoster, or zona. The word shingles comes from the Latin word cingulum, which means belt. There are approximately 1 million estimated new cases per year in the U.S., with almost one out of every three people developing shingles at some point in their lifetime. Though most people who develop shingles will only have a single episode, there are some who develop recurrent cases of shingles. Shingles is more common in older individuals and in those with weakened immune systems. The characteristic rash of shingles typically appears after an initial period of burning, tingling, itching, or stinging in the affected area. After a few days, the rash then appears in a stripe or band-like pattern along a nerve path (called a dermatome), affecting only one side of the body without crossing the midline. The rash erupts as clusters of small red patches that develop into blisters, which may appear similar to chickenpox. The blisters then break open and slowly begin to dry and eventually crust over. 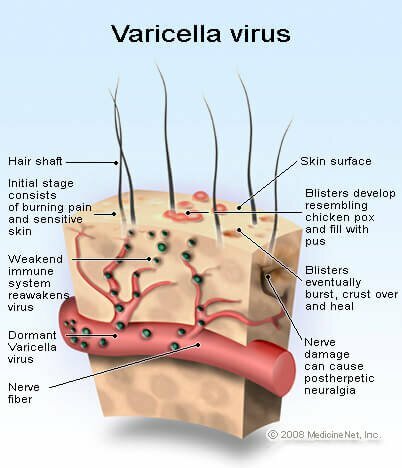 Shingles is caused when the varicella zoster virus (VZV) reactivates, the same virus that causes chickenpox (varicella). 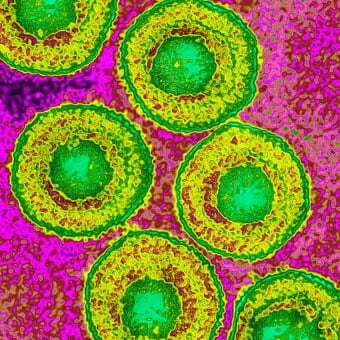 Varicella-zoster belongs to the Herpesviridae family. Only those who have previously had chickenpox can develop shingles later in life, and rarely, those who have received the varicella vaccine can develop shingles later in life. Initial exposure to VZV, which typically occurs in children or adolescents, leads to the development of varicella. After the episode of chickenpox has resolved, the virus remains in a dormant state in the nervous system in certain nerve cells of the body located in the spine. While in this inactive state, you will not experience any symptoms from the varicella zoster virus. However, in certain individuals and for reasons that are not completely clear, the varicella zoster virus may re-emerge years later and travel along nerve fibers to cause shingles. The location and pattern of the ensuing rash reflects the region of the affected nerves. Though similar in name, herpes zoster is not the same disease as herpes simplex (which is caused by the herpes simplex virus causing cold sores, fever blisters, or genital herpes). Increasing age: Though shingles can rarely occur in children, it is much more common in older adults, with the incidence increasing with age. This is thought to be in large part due to waning immunity as people age. Approximately 50% of all cases of shingles occur in adults 60 years of age or older. Weakened immune system: Individuals with impaired immune systems have a higher probability of developing shingles. This can be seen in diseases such as cancer and HIV/AIDS, or in individuals taking certain medications. Patients taking steroids or other immunosuppressive medications, such as people who have undergone organ transplants, and individuals with certain autoimmune diseases (such as rheumatoid arthritis, systemic lupus erythematosus, Crohn's disease, and ulcerative colitis) are at increased risk for developing shingles. Psychological and emotional stressors are also thought to possibly contribute to the development of shingles, perhaps from the detrimental effects of stress on the immune system and the person's health. The virus that causes shingles, the varicella zoster virus, can be transmitted from person to person by direct contact with the fluid from the active blistering rash. Therefore, susceptible individuals should avoid contact with people who have active shingles, especially pregnant women who have never had chickenpox and immunocompromised individuals. It cannot be transmitted by coughing or sneezing, and it is not contagious before the blisters appear. Once the shingles rash has dried and developed crusting, it generally is not considered to be contagious. There are a few important points to consider when discussing the varicella zoster virus and transmissibility. If an individual who has never had chickenpox or the chickenpox vaccine comes in direct contact with the fluid from the shingles rash, they may go on to develop chickenpox, but they will not immediately develop shingles. It is possible, however, for them to develop shingles later in life, just as it is with others who have previously been exposed to the virus and developed chickenpox. Also, if you have previously been exposed to the varicella zoster virus and you have had chickenpox, you will not contract the virus from others with shingles. Shingles usually starts with burning, tingling, itching, or stinging in the region where the rash will ultimately develop. Sometimes, this pain can be severe and individuals may complain of extremely sensitive skin. This discomfort typically occurs a few days before the visible rash develops. In rare instances, the characteristic shingles rash will not appear (a condition called zoster sine herpete). A few days after the skin discomfort begins (or rarely, several weeks afterward), the characteristic rash of shingles will appear. It typically begins as clusters of small red patches that eventually develop into small blisters. These fluid-filled blisters eventually break open, and the small sores begin to slowly dry and scab over. The crusts usually fall off after several weeks, and the shingles rash typically clears up after approximately two to four weeks. Though uncommon, in cases of a severe rash, skin discoloration or scarring of the skin is possible. The location of the shingles rash can vary. Though shingles can appear almost anywhere on the body, it most commonly affects the torso and the face (including the eyes, ears, and mouth). It is often present in the area of the ribcage or the waist. This characteristic rash is in a stripe or band-like pattern that affects only one side of the body (the right or the left), and it usually does not cross over the midline. In some cases, the rash can affect adjacent dermatomes (an area of skin that is supplied by a single spinal nerve), and rarely it can affect three or more dermatomes (a condition termed disseminated zoster). Disseminated zoster generally occurs only in individuals with a compromised immune system. Shingles can often be diagnosed by your doctor based upon the distinctive appearance and distribution of the characteristic shingles rash. A painful, blistering rash that is localized to defined dermatomes is a sign highly suggestive of shingles. Blood work or other testing is usually not necessary. Diagnosing shingles before the appearance of the rash or in cases of zoster sine herpete (zoster without rash) can be challenging. In cases where the diagnosis is unclear, laboratory tests are available to help confirm the diagnosis. Depending on the clinical situation, testing can be done using either blood work (to detect antibodies to the varicella zoster virus) or by specialized testing of skin lesion samples. Shingles is most commonly diagnosed and treated by a primary care physician (family practitioner, pediatrician, and internist) or an emergency medicine physician. For certain individuals who develop complications of shingles, a specialist in ophthalmology, neurology, or infectious disease may also be involved. Select patients with postherpetic neuralgia may require the care of a pain specialist. The treatment for shingles is aimed at diminishing the effects of the virus, as well as pain management. There are several medications that can be used, and your doctor will discuss the best treatment options for your particular situation. The vast majority of cases of shingles can be managed at home. In some cases, people with an impaired immune system or individuals with severe symptoms and/or complications may require hospital admission. Antiviral drugs (medications used to combat viral infections) are used against the varicella zoster virus. These medications help shorten the course of the illness, decrease the severity of the illness, and hasten the healing of the skin lesions. They may also help prevent the potential complications sometimes encountered with shingles. Antiviral medications are most effective when started within 72 hours of the first appearance of the rash, however, in select cases of shingles (for example, in an immunocompromised person), it can be started after 72 hours. There are several antiviral medications that can be used, including acyclovir (Zovirax), famciclovir (Famvir), and valacyclovir (Valtrex). In certain situations, intravenous (IV) antiviral medication may need to be administered. Pain medication can be used to help relieve the discomfort caused by the rash, which can sometimes be severe. 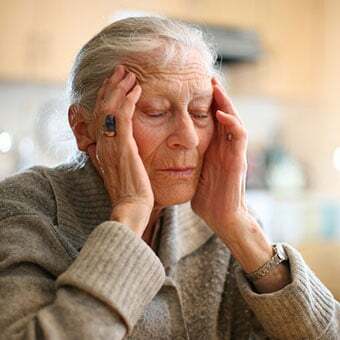 For some individuals with mild shingles pain, over-the-counter analgesics such as acetaminophen (Tylenol) or the anti-inflammatory drug ibuprofen (Motrin or Advil) may be all that is needed. Individuals with more severe pain may require stronger opioid pain medication. Over-the-counter antihistamine medication such as diphenhydramine (Benadryl) may help alleviate the localized itching. The use of a corticosteroid medication, such as prednisone, is used only in select cases of complicated shingles, such as those with eye or ear involvement, and it should be used with concurrent antiviral therapy. Prednisone is not generally recommended in cases of uncomplicated shingles. Care of the skin rash can be provided at home, and this can offer some symptom relief. 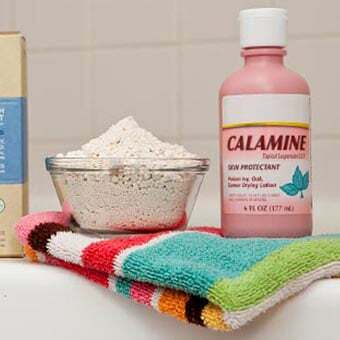 Topical calamine lotion can be applied to the rash in order to decrease itching. Cool wet compresses against the painful rash can sometimes be soothing, and for some individuals, a compress with aluminum acetate solution (Burow's solution or Domeboro) may also be helpful. For some, colloidal oatmeal baths may also provide relief from the itching. It is important to maintain good personal hygiene, avoid scratching the rash, wear loose-fitting clothes, and to try to keep the affected area clean in order to prevent a secondary bacterial infection of the skin. The rash should be covered to decrease the risk of transmissibility should you come into contact with susceptible individuals. The duration of an acute shingles outbreak may vary, but typically it will last anywhere between two to four weeks. In some individuals, it may last longer. Though shingles often resolves without any major problems, there are several potential complications that can arise from shingles. Postherpetic neuralgia (PHN): This is the most common complication of shingles. PHN is characterized by persistent pain and discomfort in the area affected by shingles. The pain can last for months to several years after the rash has cleared up. 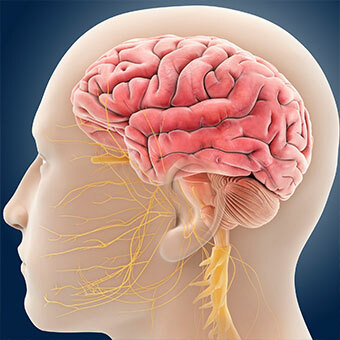 This complication is thought to occur because of damage to the affected nerves. The pain can sometimes be severe and difficult to control, and the likelihood of developing postherpetic neuralgia increases with age. This chronic post-herpetic pain can sometimes lead to depression and disability. 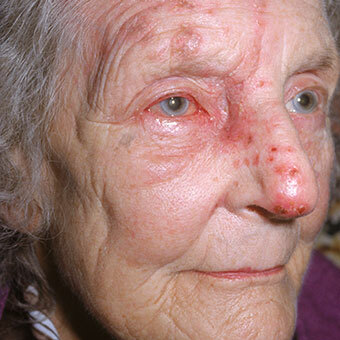 In people 60 years of age and older with shingles, postherpetic neuralgia will develop in approximately 15%-25% of cases. It rarely occurs in people under 40 years of age. Timely treatment with antiviral medication during a shingles outbreak may help reduce the incidence of developing postherpetic neuralgia. If postherpetic neuralgia develops, there are various treatment options available including topical creams such as capsaicin (Zostrix), topical anesthetic lidocaine patches (Lidoderm), antiseizure medications such as gabapentin (Neurontin), pregabalin (Lyrica), tricyclic antidepressant medications, and opioid pain medications. Intrathecal glucocorticoid injections may be useful for select patients with postherpetic neuralgia who do not respond to conventional medications and treatment measures. Ramsay Hunt syndrome: If shingles affects the nerves of the face, this uncommon complication can lead to facial muscle paralysis, and the characteristic rash can affect the ear and the ear canal, and rarely the mouth. Symptoms may include ear pain, ringing in the ears, hearing loss, and dizziness. Though most people recover fully with treatment, some individuals may have permanent facial weakness and/or hearing loss. Bacterial skin infection: A secondary bacterial infection of the skin blisters can sometimes develop, leading to cellulitis or impetigo. These skin infections may be characterized by increasing redness, tenderness, and warmth in and around the area of the rash. Most of these bacterial skin infections are caused by either Staphylococcus aureus or group A Streptococcus bacteria. These bacterial infections can be treated with antibiotics. Eye involvement: Shingles can sometimes affect the eye, a condition termed herpes zoster ophthalmicus. In certain cases, it can lead to blindness. Individuals with a rash involving the eye, forehead, or nose should have a careful eye evaluation performed by a doctor, as prompt medical treatment may be necessary. Encephalitis: Rarely, individuals with shingles may develop inflammation of the brain (encephalitis). This condition can be life-threatening if severe, especially in people with an impaired immune system. Disseminated herpes zoster: This serious and potentially life-threatening condition occurs most commonly in people with an impaired immune system. It is rare in individuals who are otherwise healthy. With disseminated herpes zoster, the varicella zoster virus becomes more widespread. In addition to causing a more widespread rash, the virus can also spread to other organs of the body, including the brain, lung, and liver. Though most people will experience only one episode of shingles during their lifetime, recurrence can occur in certain individuals. 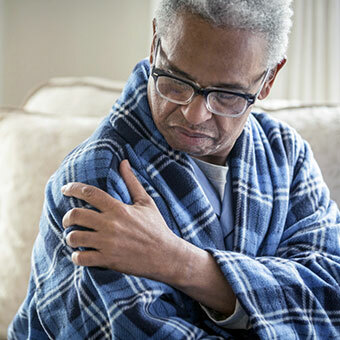 In order to help prevent recurrent episodes of shingles, individuals with no contraindications can receive the zoster vaccine (Shingrix), which can prevent recurrent episodes of shingles. Otherwise, people who do experience a recurrent case of shingles should see their doctor as soon as the rash appears to promptly receive antiviral medication. Generally speaking, shingles typically resolves within two to four weeks in most individuals. The prognosis is excellent for younger and healthy individuals who develop shingles, with very few experiencing any complications. 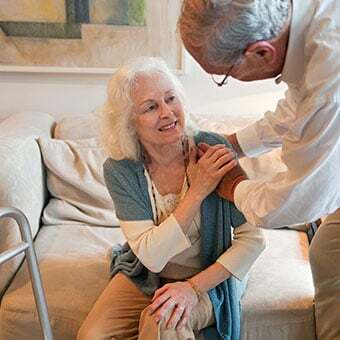 However, in older individuals and in those with compromised immune systems, the prognosis is more guarded, as complications and more severe outbreaks of shingles occur more commonly in these groups. Approximately 1%-4% of people who develop shingles require hospitalization for complications, and about 30% of those hospitalized have impaired immune systems. 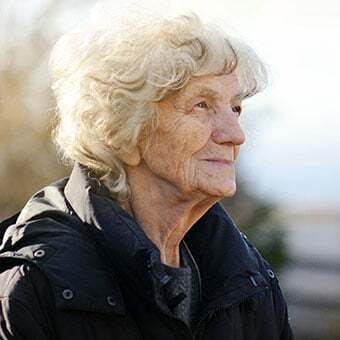 In the U.S., it is estimated that there are approximately 96 deaths per year directly related to the varicella zoster virus, the vast majority of which occur in the elderly and in those who are immunocompromised. In October 2017, the United States Food and Drug Administration (FDA) approved Shingrix, a non-live vaccine to prevent shingles. 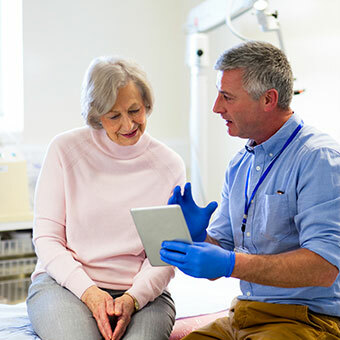 The Advisory Committee on Immunization Practices (ACIP) subsequently endorsed Shingrix as the preferred vaccine for the prevention of herpes zoster and its related complications in healthy adults 50 years of age and older. Shingrix is also recommended for adults who previously received the current shingles vaccine Zostavax, which was approved by the FDA in 2006. Shingrix, a two-dose vaccine, was found to prevent shingles in more than 90% of patients who received it in clinical trials. By preventing shingles, Shingrix also decreases the incidence of postherpetic neuralgia. 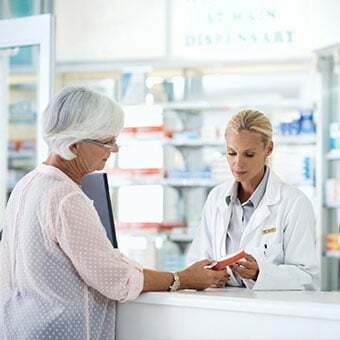 Not only does Shingrix provide superior efficacy across all age groups, but it is also felt to confer longer lasting immunity than Zostavax, which has experienced temporary vaccine shortages due to supply issues. Shingrix is expected to be widely available to U.S. consumers in early 2018. During clinical trials, the most common side effects associated with Shingrix included pain, swelling, and redness at the site of injection, headache, muscle aches, fever, chills, and upset stomach. Research funded and conducted by the National Institute of Neurological Disorders and Stroke (NINDS) on shingles and the varicella zoster virus is ongoing to better understand the behavior of this virus. Several other organizations are also involved in research to understand, treat, and prevent varicella zoster virus reactivation. At this time, Shingrix is recommended for healthy adults who are 50 years of age or older. Individuals should receive the vaccine whether or not they recall having had chickenpox, as data shows that more than 99% of Americans over 40 years of age have had chickenpox, even if they do not remember having had it. Shingrix is also recommended for individuals who have already received the Zostavax vaccine, as Shingrix has demonstrated superior efficacy and longer lasting protection. Shingrix is not indicated for the prevention of primary varicella (chickenpox) infection. 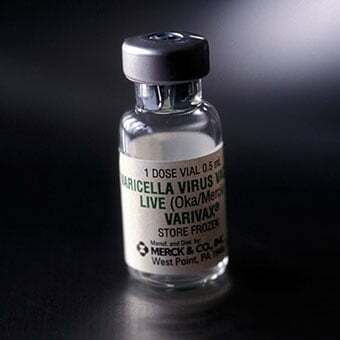 The CDC recommends the varicella vaccine for healthy people who do not have evidence of immunity to varicella, including children, adolescents, and adults. United States. Centers for Disease Control and Prevention. "Shingles (Herpes Zoster)." <https://www.cdc.gov/shingles/index.html>. Oct. 17, 2017. United States. Centers for Disease Control and Prevention. "Vaccines and Preventable Diseases: What Everyone Should Know About Shingles Vaccine." <https://www.cdc.gov/vaccines/vpd/shingles/public/index.html>. Mar. 4, 2019. United States. National Foundation for Infectious Diseases. "Shingles (Herpes Zoster)." <http://www.nfid.org/idinfo/shingles>. United States. National Institutes of Health. National Institute on Aging. "Shingles." <https://www.nia.nih.gov/health/shingles>. Oct. 29, 2018.